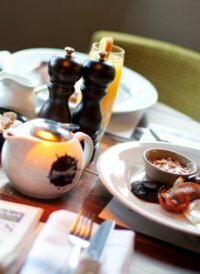 Experience inspirational design and inspired service at the boutique Hotel Indigo London-Paddington. The stately townhouse of Hotel Indigo London-Paddington overlooks the trim lawn of Norfolk Square, yet this traditional exterior belies the contemporary design in our stylish Lobby. Its glass staircase spirals to the double-height ceiling, far above the cyan glow of the Front Desk. Leave your bags with us while you celebrate your arrival in the bar or ask us to help you get to know the neighbourhood, which is depicted in the unique artworks of our stylish rooms. Hotel Indigo London-Paddington is on thrumming London Street . Hyde Park is a 10-minute walk and you can stroll to the offices of Paddington Basin in 15 minutes. You're 3 minutes' walk from Paddington rail station . From here the Heathrow Express will wing you to London Heathrow Airport in 15 minutes or you can zoom through the city on the London Underground and buses. Start the day in the Fitness Centre or take time out for a traditional afternoon tea in our brasserie. You won't want to leave our sumptuous beds, and can make the most of complimentary wireless Internet anywhere in the hotel. Your Concierge will help you catch a show in the West End or hit the shops of Oxford Street . At Hotel Indigo London-Paddington, the city is on your doorstep. Just let us know where you want to go, and we'll get you there. "Gay Friendly". The Lincoln House Hotel is a delightful, hospitable hotel of Georgian Town House Character, built at the end of the 18th Century at the time of King George III. We are situated in a prime location in central London near Marble Arch & Oxford Street shopping area. Our hotel is within easy reach of all London airports & the new St Pancras Eurostar station. We offer a relaxed and welcoming environment for business, shopping & leisure breaks. As a family run business we know the importance of comfort and fine detail and provide accommodation which is suitable for all budgets; ensuring that you get all the necessities to make your stay comfortable. We have the pleasure of placing you at the centre of our attention. "Gay friendly"
Mercure London Paddington Hotel is a four star property franchised with Accor Hotels and situated adjacent to Paddington Station and the Heathrow Express connection. The property has 82 bedrooms, 3 meeting rooms for up to 12 people, a bar and on site Garfunkel's restaurant. All rooms are fully air conditioned and Wifi is available throughout the building. Executive rooms also offer bathrobes, slippers and complimentary soft drinks. Gay friendly. The Mercure London Kensington Hotel is a 4 star luxury hotel located in Kensington and Chelsea district near Royal Albert Hall and Earls Court. Book online to get the best rate. Mercure London Kensington Hotel is a four star hotel situated in fashionable Kensington minutes from Knightsbridge and Earls Court. It is ideally situated for Earls Court Exhibition Centre and Olympia as well as exporing the West End. The property has recently been refurbished to a high standard and offers Wifi and air conditioning throughout. Executive rooms also offer bathrobes, slippers and complimentary soft drinks. 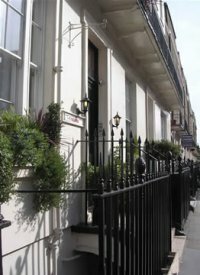 "Gay Friendly"
For inexpensive london hotel accommodation in at the Oxford Hotel in Bayswater, located central London. Here at The Oxford Hotel in Bayswater, London, we can guarantee you friendly service at excellent value for money, with the heart of central London only minutes away. We pride ourselves on our attention to detail and ensuring your trip is as enjoyable as possible. 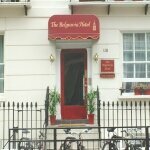 Our philosophy is to provide cheap and inexpensive accommodation in London without compromising on quality. So if you're after a London England hotel on a budget take a look around The Oxford Hotel and contact us for availability. "Gay friendly"
Quality Crown Hotel Hyde Park is one of the best 4 star Hyde Park hotels in London. Discount prices are available at Quality Crown London Hyde Park Hotel. Luxury 4 star Hyde Park hotels: Wifi and FREE English Breakfast! Quality Crown Hotel in London Hyde Park is nestled in a peaceful garden square next to Hyde Park and 2 minutes from Paddington Station & Heathrow Express, getting you to Heathrow Airport in 15 minutes. Despite its picturesque setting, our Hyde Park hotel lies in the heart of the city with Oxford Street, Covent Garden nearby. Blending classic English charm with chic design, Quality Crown Hyde Park rivals other Hyde Park hotels with modern amenities such as WiFi & interactive flat-screen TVs, making it one of the best 4 star hotels near Paddington Station. "Gay Friendly"
Bed and breakfast offered at 16 St Alfege in an unusual, interior designed property in central Greenwich, close to all amenities and transport links. Easy access to the West End. Welcoming hosts will make your stay comfortable and memorable. Four poster ensuite room available. 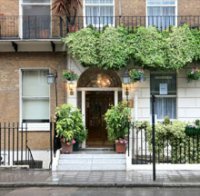 "Gay friendly"
Bed and Breakfast offering from Belgravia Hotel London, Offering budget guest house with bed and breakfast facility at London hotel discount rates by Belgravia B&B packages of the Belgravia Hotel. 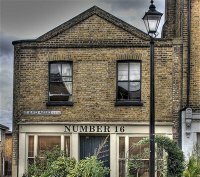 "Gay friendly"
Located in Belgravia between Victoria rail and coach stations.We are a gay friendly B&B ideally situated for the West End (Soho is a 25 minute walk),Londons famous shopping areas and many of it's famous landmarks. Contact Mark or Simon.